Cottage on Blackbird Lane: Three! 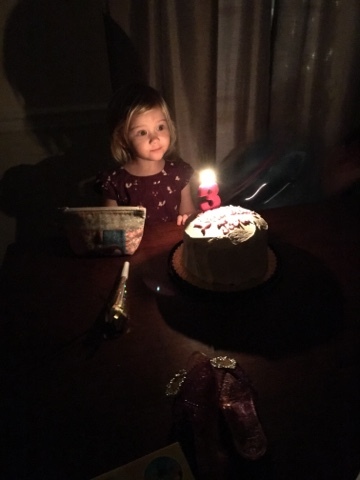 Our sweet little girl turned THREE today. Gasp! The little snuggle bear toddler has grown so. What a fun year we had being two. Learning so many new things, independence has blossomed, and the vocabulary. Wow! We have a lovely conversational little girl telling us all kinds of wonderful stories about her day. She still loves her blankies, fish, pink, fancy shoes, dressing up like a princess, books, and being outside. Her left-handedness is steadfast and here to stay. Because she loves fish so very much we'll be taking a trip to the National Aquarium in Baltimore tomorrow. She'll be so excited I'm looking forward to her seeing the surprise. We found her a small cake at our favorite grocery store, Wegmans. She chose the pink candle and of course the frosting to match. It was such fun to watch her tell the baker all about how it's her birthday. That jubilant smile she beamed was enough to pass on joy to the people around us in line. This is what a birthday should be. Happiness and joy that YOU were added to this world. 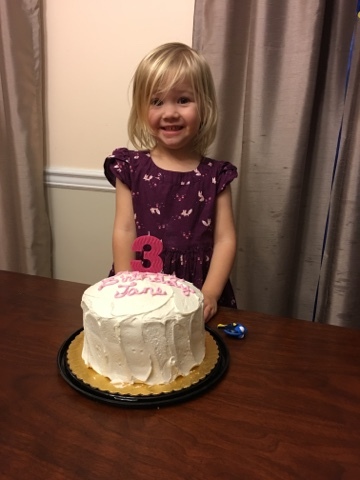 "I am here and I am happy on this day" is the statement a three year old feels on her birthday. That's beautiful. The warmth of family and a lovely cake. 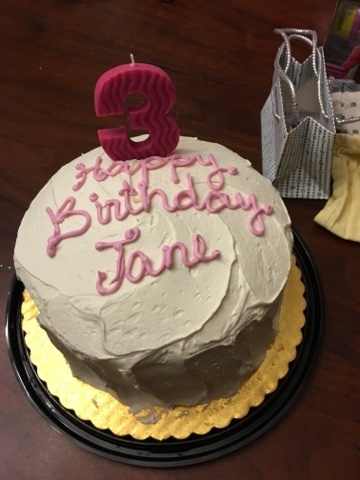 Happy birthday sweet Janie!